LAWMA is a non-profit, member-owned corporation that makes replacements to the Arkansas River for the depletions caused by membership’s groundwater use. LAWMA members own shares of stock that represent surface water purchased by the group. These shares allow for a certain amount of pumping by members. The LAWMA replacement plan allows for the membership to use groundwater resources in the most effective and economical manner, while still keeping the river whole for other water users. 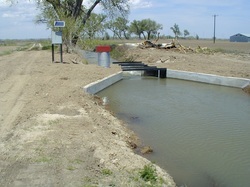 LAWMA helps to provide economic development to the region by making it possible for new enterprises to use groundwater.